Chiroti Rava Halbai is the easiest and tastiest sweet you can prepare for guests, festivals and/or just to satisfy your sweet cravings. 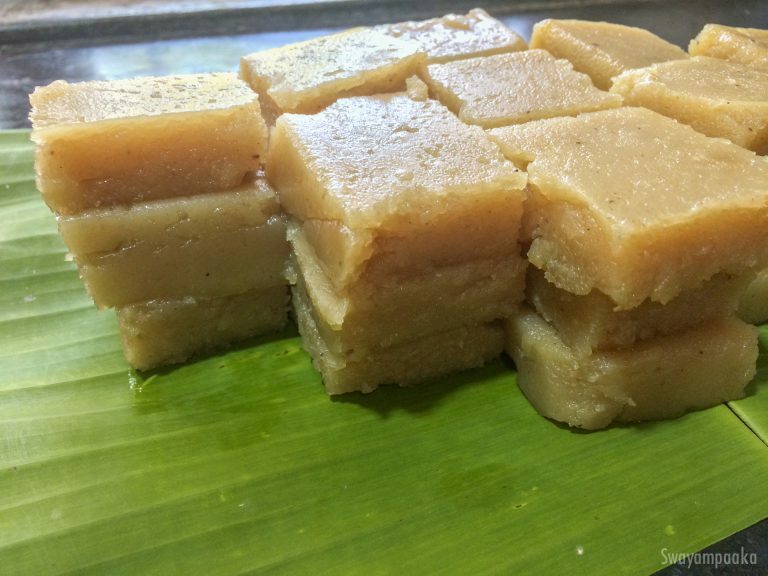 Halbai is the traditional sweet prepared in karnataka especially Malnad and Mysore region. This sweet has rich flavor of coconut and goodness from jaggery. This dessert is modified version of the traditional coconut -rice -jaggery halbai. This dessert is modified version of the traditional coconut -rice -jaggery halbai. Please watch the above video for detailed instructions to " How to make Rava Halbai"
Soak the chiroti rava in 2 cups of water for minimum 10 minutes to 1 hour. Grind it along with water, cloves , coconut, and cardamom to a fine paste. Transfer it to a thick bottom pan. Melt the jaggery with ¼ cup water. Strain this jaggery to the rava coconut paste. Clean the jar with ¼ cup water and add it the mix. Mix it thoroughly and keep it on the stove on high heat. Keep on stirring it to avoid the burn at the bottom of the pan. Whenever the mix starts to stick to the pan add little ghee and mix it. Once the halbai mix leaves the pan (it will take around 12 to 13 minutes,please watch the video) turn off the heat and transfer it onto the greased plate, spread it evenly. Once halbai is warm enough grease the knife and cut this into desired shape and size.